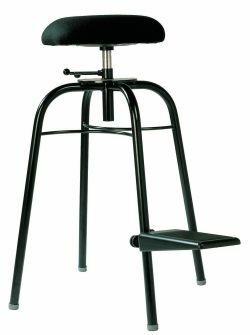 WB3 Bass Stool. Our Whitebox3 Bass Stools (where budgets are restricted) feature a generously sized round, padded, upholstered seat with four footrests set at different heights (see photo right). The frame is black as standard with a wide choice of fabric colours available. 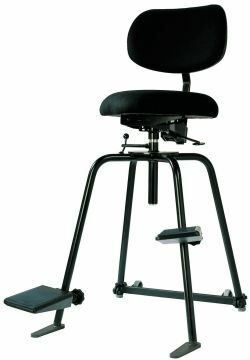 You can have up to four footrests at a uniform or differing heights and the stool legs are available at a fixed height or adjustable telescopic. 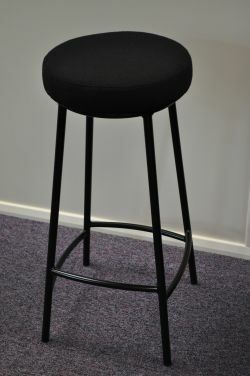 We can create a bass stool to meet your exact requirements. The Bass Stool pictured below left was specifically created for the London Philharmonic Orchestra who required a wider, ultra-thick cushioned seat and uniform footrest. Wilde & Spieth Posture Designed Bass Chair. A four-legged base (black or chrome) equipped with anti-tip safety device, two padded folding, adjustable footrests and chair back and seat available in either laminated beech veneer (natural or stained) or upholstered. 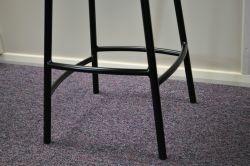 The round seat (non-swivel) features ventilation holes as standard and the backrest is adjustable in height and angle. Wilde & Spieth Travel Bass Stool. 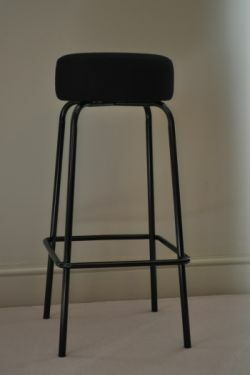 A simpler version of the above stool, without backrest and one padded footrest. Wilde & Spieth Piano Stool. 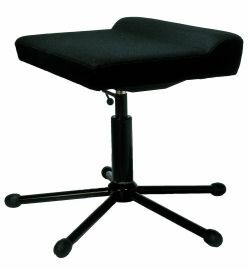 A five-legged based (black or chrome) with height adjustable, anatomically formed foam seat (non-swivel). Seat height from 460 to 540mm.